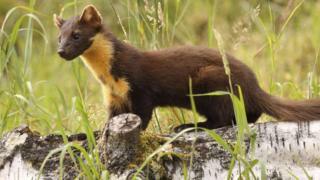 Henry Wild, whose family owns the caravan park, said the Scots pines are one of the pine marten's favourite locations for building nests, and the seeds in the cones are a favoured food for red squirrels. He said: "Grey squirrels are blamed for the drastic decline of our native reds, but pine martens have been shown to keep their numbers right down as they prey readily on the greys. "Reds aren't such easy meat because they are light enough to get to the end of branches where the martens can't follow, and are less dependent than greys on foraging on the woodland floor."